There's a new war of words brewing between the tech industry and President Trump. Apple (AAPL), Microsoft (MSFT), Salesforce (CRM), Google (GOOGL) and other tech companies are speaking out against the Trump administration's decision this week to withdraw Obama-era protections for transgender students in public schools. 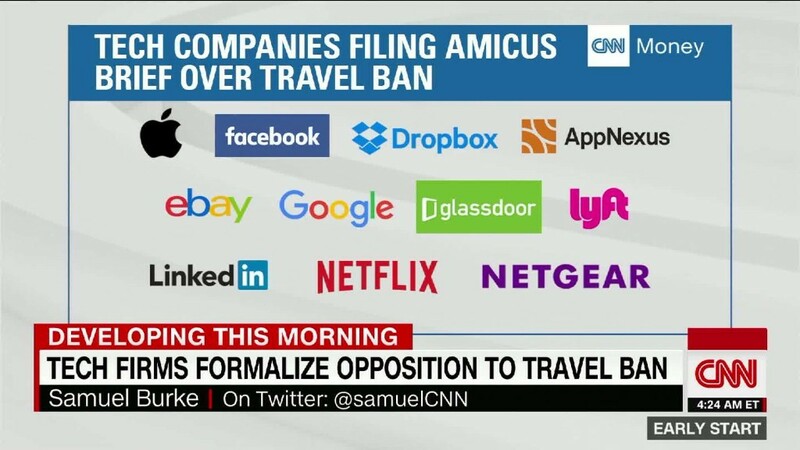 Many of these tech companies also pushed back against a controversial North Carolina law last year that banned transgender individuals from using public bathrooms for the gender with which they identify. However, that outspokenness took place under the Obama administration, which also opposed the bathroom law. Now, tech companies must reconsider the approach. They face pressure from progressive employees and customers to push back against Trump's most controversial policies. But they also need to work with the new administration on key issues like tax reform and regulations. Silicon Valley has already pushed back against Trump's travel ban. The transgender issue could turn into the second high-profile clash in the opening days of the new administration. Apple said in a statement Thursday that it "believes everyone deserves a chance to thrive in an environment free from stigma and discrimination." "We support efforts toward greater acceptance, not less, and we strongly believe that transgender students should be treated as equals," the company added. "We disagree with any effort to limit or rescind their rights and protections." In a statement provided to CNNTech, Google said it is "deeply concerned to see a roll-back in transgender students rights." Brad Smith, Microsoft's president and chief legal officer, was one of the first tech executives to criticize the move. Lyft had some of the strongest words against the policy reversal. "Removing protections for transgender students is wrong," the company said in a statement provided to CNNTech. "We oppose this action and, as always, stand in support of the LGBTQ community." Uber, Lyft's chief rival, touted its "longstanding opposition to harmful initiatives aimed at the LGBT community." Benioff was one of the most outspoken critics of the North Carolina bathroom bill. On Wednesday, he retweeted a post from the ACLU pledging to fight for transgender students and posted his own call to action. A Facebook (FB) spokesperson said the company stands for "ensuring equal rights for everyone, including transgender students." The spokesperson added: Facebook "will continue to advocate for more rights instead of fewer." IBM (IBM) CEO Ginni Rometty serves on Trump's business advisory council, but the company said Thursday that it is "opposed to discrimination in all its forms, including any policies that discriminate based on gender identity in education." In a broad statement to CNNTech on Thursday, Schulman said PayPal is committed to working with "communities, regulators, and governments around the world to foster inclusion, understanding and empower the best of human potential." Pinterest said in a statement: "We oppose the decision to weaken protections for transgender students." Yahoo (YHOO) called the Trump administration's decision "troubling," adding it "goes against all that we believe in." Tumblr, owned by Yahoo, echoed that point. "We do not tolerate discrimination of any kind, and the move to rollback federal protections for transgender students at a critical time in their lives is unacceptable," Victoria McCullough, Tumblr's social impact and public policy lead, said in a statement. Jack Dorsey, CEO of both Square (SQ) and Twitter (TWTR), tweeted a message against the administration's move late Thursday. "Rolling back rights for transgender students is wrong. Twitter and Square stand with the LGBTQ community, always."